The first book in a contemporary fantasy series that introduces the fast-talking Greta Helsing, doctor to London’s supernatural community. The sky was fading to ultramarine in the east over the Victoria Embankment when a battered Mini pulled in to the curb, not far from Blackfriars Bridge. Here and there in the maples lining the riverside walk, the morning’s first sparrows had begun to sing. A woman got out of the car and shut the door, swore, put down her bags, and shut the door again with more applied force; some fellow motorist had bashed into the panel at some time in the past and bent it sufficiently to make this a production every damn time. The Mini really needed to be replaced, but even with her inherited Harley Street consulting rooms Greta Helsing was not exactly drowning in cash. She glowered at the car and then at the world in general, glancing around to make sure no one was watching her from the shadows. Satisfied, she picked up her black working bag and the shapeless oversize monster that was her current handbag and went to ring the doorbell. It was time to replace the handbag, too. The leather on this one was holding up but the lining was beginning to go, and Greta had limited patience regarding the retrieval of items from the mysterious dimension behind the lining itself. The house to which she had been summoned was one of a row of magnificent old buildings separating Temple Gardens from the Embankment, mostly taken over by lawyers and publishing firms these days. It was a testament to this particular homeowner’s rather special powers of persuasion that nobody had succeeded in buying the house out from under him and turning it into offices for overpriced attorneys, she thought, and then had to smile at the idea of anybody dislodging Edmund Ruthven from the lair he’d inhabited these two hundred years or more. He was as much a fixture of London as Lord Nelson on his pillar, albeit less encrusted with birdlime. She was just about as tall as he was, five foot five and a bit, which made it easy to look right into his eyes and be struck every single time by the fact that they were very large, so pale a grey they looked silver-white except for the dark ring at the edge of the iris, and fringed with heavy soot-black lashes of the sort you saw in advertisements for mascara. He looked tired, she thought. Tired, and older than the fortyish he usually appeared. The extreme pallor was normal, vivid against the pure slicked-back black of his hair, but the worried line between his eyebrows was not. The entryway of the Embankment house was floored in black-and-white-checkered marble, and a large bronze ibis stood on a little side table where the mail and car keys and shopping lists were to be found. The mirror behind this reflected Greta dimly and greenly, like a woman underwater; she peered into it, making a face at herself, and tucked back her hair. It was pale Scandinavian blonde and cut like Liszt’s in an off-the-shoulder bob, fine enough to slither free of whatever she used to pull it back; today it was in the process of escaping from a thoroughly childish headband. She kept meaning to have it all chopped off and be done with it but never seemed to find the time. Greta Helsing was thirty-four, unmarried, and had taken over her late father’s specialized medical practice after a brief stint as an internist at King’s College Hospital. For the past five years she had run a bare-bones clinic out of Wilfert Helsing’s old rooms in Harley Street, treating a patient base that to the majority of the population did not, technically, when you got right down to it, exist. It was a family thing. There had never been much doubt which subspecialty of medicine she would pursue, once she began her training: treating the differently alive was not only more interesting than catering to the ordinary human population, it was in many ways a great deal more rewarding. She took a lot of satisfaction in being able to provide help to particularly underserved clients. Greta’s patients could largely be classified under the heading of monstrous—in its descriptive, rather than pejorative, sense: vampires, were-creatures, mummies, banshees, ghouls, bogeymen, the occasional arthritic barrow-wight. She herself was solidly and entirely human, with no noticeable eldritch qualities or powers whatsoever, not even a flicker of metaphysical sensitivity. 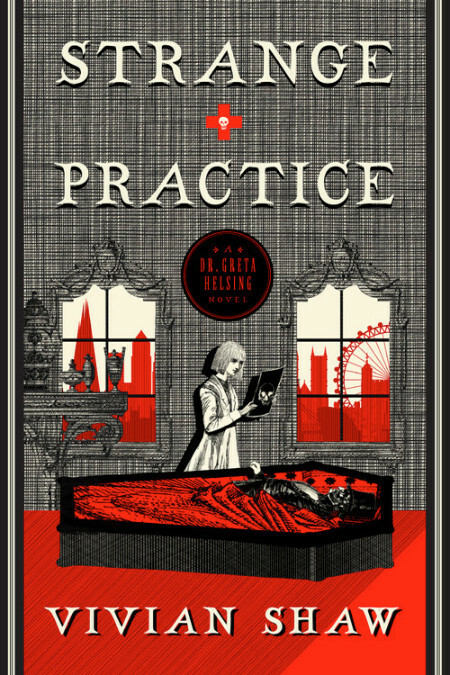 Some of her patients found it difficult to trust a human physician at first, but Greta had built up an extremely good reputation over the five years she had been practicing supernatural medicine, largely by word of mouth: Go to Helsing, she’s reliable. And discreet. That was the first and fundamental tenet, after all. Keeping her patients safe meant keeping them secret, and Greta was good with secrets. She made sure the magical wards around her doorway in Harley Street were kept up properly, protecting anyone who approached from prying eyes. Ruthven appeared in the kitchen doorway, outlined by light spilling warm over the black-and-white marble. “Greta?” he said, and she straightened up, realizing she’d been staring into the mirror without really seeing it for several minutes now. It really was late. Fatigue lapped heavily at the pilings of her mind. “Sorry,” she said, coming to join him, and a little of that heaviness lifted as they passed through into the familiar warmth and brightness of the kitchen. It was all blue tile and blond wood, the cheerful rose-gold of polished copper pots and pans balancing the sleek chill of stainless steel, and right now it was also full of the scent of really good coffee. Ruthven’s espresso machine was a La Cimbali, and it was serious business. He handed her a large pottery mug. She recognized it as one of the set he generally used for blood, and had to smile a little, looking down at the contents—and then abruptly had to clamp down on a wave of thoroughly inconvenient emotion. There was no reason that Ruthven doing goddamn latte art for her at half-past four in the morning should make her want to cry. He was good at it, too, which was a little infuriating; then again she supposed that with as much free time on her hands as he had on his, and as much disposable income, she might find herself learning and polishing new skills simply to stave off the encroaching spectre of boredom. Ruthven didn’t go in for your standard-variety vampire angst, which was refreshing, but Greta knew very well he had bouts of something not unlike depression—especially in the winter—and he needed things to do. She, however, had things to do, Greta reminded herself, taking a sip of the latte and closing her eyes for a moment. This was coffee that actually tasted as good as, if not better than, it smelled. Focus, she thought. This was not a social call. The lack of urgency in Ruthven’s manner led her to believe that the situation was not immediately dire, but she was nonetheless here to do her job. The passive-aggressive-letter stage tended to indicate that his levels of ennui were reaching critical intensity. Greta just nodded, watching him. “I don’t know if you’ve ever read an ancient penny-dreadful called Varney the Vampyre, or The Feast of Blood,” he went on. “A lunar sensitive? I haven’t actually met one before,” she said, clinical interest surfacing through the fatigue. The vampires she knew were all classic draculines, like Ruthven himself and the handful of others in London. Lunar sensitives were rarer than the draculine vampires for a couple of reasons, chief among which was the fact that they were violently—and inconveniently—allergic to the blood of anyone but virgins. They did have the handy characteristic of being resurrected by moonlight every time they got themselves killed, which presumably came as some small comfort in the process of succumbing to violent throes of gastric distress brought on by dietary indiscretion. Ruthven had lit a fire, despite the relative mildness of the evening, and the creature lying on the sofa was covered with two blankets. Greta glanced from him to Ruthven, who shrugged a little, that line of worry between his eyebrows very visible. According to him, Sir Francis Varney, title and all, had come out of his faint quite quickly and perked up after some first aid and the administration of a nice hot mug of suitable and brandy-laced blood. Ruthven kept a selection of the stuff in his expensive fridge and freezer, stocked by Greta via fairly illegal supply chain management—she knew someone who knew someone who worked in a blood bank and was not above rescuing rejected units from the biohazard incinerator. “Do you need anything?” he asked, still standing in the doorway as Greta pulled over a chair and sat down beside the sofa. When he had gone she tucked back her hair and leaned over to examine her patient. He took up the entire length of the sofa, head pillowed on one armrest and one narrow foot resting on the other, half-exposed where the blankets had fallen away. She did a bit of rough calculation and guessed he must be at least six inches taller than Ruthven, possibly more. His hair was tangled, streaky-grey, worn dramatically long—that was aging-rock-frontman hair if Greta had ever seen it, but nothing else about him seemed to fit with the Jagger aesthetic. An old-fashioned face, almost Puritan: long, narrow nose, deeply hooded eyes under intense eyebrows, thin mouth bracketed with habitual lines of disapproval. Or pain, she thought. That could be pain. The shifting of a log in the fireplace behind Greta made her jump a little, and she regathered the wandering edges of her concentration. With a nasty little flicker of surprise she noticed that there was a faint sheen of sweat on Varney’s visible skin. That really wasn’t right. “Sir Francis?” she said, gently, and leaned over to touch his shoulder through the blankets—and a moment later had retreated halfway across the room, heart racing: Varney had gone from uneasy sleep to sitting up and snarling viciously in less than a second. It was not unheard‑of for Greta’s patients to threaten her, especially when they were in considerable pain, and on the whole she probably should have thought this out a little better. She’d only got a glimpse before her own instincts had kicked in and got her the hell out of range of those teeth, but it would be a while before she could forget that pattern of dentition, or those mad tin-colored eyes. He covered his face with his hands, shoulders slumping, and instead of menace was now giving off an air of intense embarrassment. He was looking at her from behind his fingers, and the eyes really were metallic. Even partly hidden she could see the room’s reflection in his irises. She wondered if that was a peculiarity of his species, or an individual phenomenon. When Varney finally took his hands away from his face, pushing the damp silvering hair back, his color was frankly terrible. He was sweating. That was not something she’d ever seen in sanguivores under any circumstance. He glanced up at her and then away again, and nodded once, leaning back against the sofa cushions, and Greta reached into her bag for the exam gloves. The wound was in his left shoulder, as Ruthven had said, about two and a half inches south of the collarbone. It wasn’t large—she had seen much nastier injuries from street fights, although in rather different species—but it was undoubtedly the strangest wound she’d ever come across. It was. Instead of just the narrow entry mark of a knife, or the bruised puncture of something clumsier, Varney’s wound appeared to have been made by something flanged. Not just two but four sharp edges, leaving a hole shaped like an X—or a cross. A lot of the organic compounds in Allium sativum triggered a severe allergic response in vampires, varying in intensity based on amount and type of exposure. This wasn’t garlic shock, or not just garlic shock, though. He was definitely running a fever, and the hole in his shoulder should have healed to a shiny pink memory within an hour or so after it happened. Right now it was purple-black and . . . oozing. This was so very much not her division. “Did—do you have any idea why they attacked you?” Or why they’d broken into his flat and poisoned it with garlic. That was a pretty specialized tactic, after all. Greta shivered in sudden unease. Unless there had been something on the blade. Something left behind. That flicker of visceral unease was much stronger now. She leaned closer, gently drawing apart the edges of the wound—the tissue was swollen, red, warmer than the surrounding skin—and was surprised to notice a faint but present smell. Not the characteristic smell of infection, but something sharper, almost metallic, with a sulfurous edge on it like silver tarnish. It was strangely familiar, but she couldn’t seem to place it. Greta was rather glad he was unconscious just at the moment, because what she was about to do would be quite remarkably painful. She stretched the wound open a little wider, wishing she had her penlight to get a better view, and he shifted a little, his breath catching; as he moved she caught a glimpse of something reflective half-obscured by dark blood. There was something still in there. Something that needed to come out right now. He emerged from the kitchen, looking anxious. “What is it? Without a word Ruthven took the instrument case and disappeared again. Greta turned her attention back to her patient, noticing for the first time that the pale skin of his chest was crisscrossed by old scarring—very old, she thought, looking at the silvery laddered marks of long-healed injuries. She had seen Ruthven without his shirt on, and he had a pretty good collection of scars from four centuries’ worth of misadventure, but Varney put him to shame. A lot of duels, she thought. A lot of . . . lost duels. Greta wondered how much of Feast of Blood was actually based on historical events. He had died at least once in the part of it that she remembered, and had spent a lot of time running away from various pitchfork-wielding mobs. None of them had been dressed up in monastic drag, as far as she knew, but they had certainly demonstrated the same intent as whoever had hurt Varney tonight. A cold flicker of something close to fear slipped down her spine, and she turned abruptly to look over her shoulder at the empty room, pushing away a sudden and irrational sensation of being watched. Don’t be ridiculous, she told herself, and do your damn job. She was a little grateful for the business of wrapping the BP cuff around his arm, and less pleased by what it told her. Not critical, but certainly a long way from what she considered normal for sanguivores. She didn’t know what was going on in there, but she didn’t like it one bit. When Ruthven returned carrying a tea tray, she felt irrationally relieved to see him—and then had to raise an eyebrow at the contents of the tray. Her probes and forceps and retractors lay on a metal dish Greta recognized after a moment as the one that normally went under the toast rack, dish and instruments steaming gently from the boiling water—and beside them was an empty basin with a clean tea towel draped over it. Everything was very, very neat, as if he had done it many times before. As if he’d had practice. “De rien,” said Ruthven, and went to fetch her penlight. A few minutes later, Greta held her breath as she carefully, carefully withdrew her forceps from Varney’s shoulder. Held between the steel tips was a piece of something hard and angular, about the size of a pea. That metallic, sharp smell was much stronger now, much more noticeable. She turned to the tray on the table beside her, dropped the thing into the china basin with a little rat-tat sound, and straightened up. The wound was bleeding again; she pressed a gauze pad over it. The blood looked brighter now, somehow, which made no sense at all. Ruthven clicked off the penlight, swallowing hard, and Greta looked up at him. “What is that thing?” he asked, nodding to the basin. “I think it’s one hell of a coincidence if it doesn’t,” Greta said. That feeling of unease hadn’t gone away with Varney’s physical improvement. It really was impossible to ignore. She’d been too busy with the immediate work at hand to consider the similarities before, but now she couldn’t help thinking about it. There had been a series of unsolved murders in London over the past month and a half. Eight people dead, all apparently the work of the same individual, all stabbed to death, all found with a cheap plastic rosary stuffed into their mouths. Six of the victims had been prostitutes. The killer had, inevitably, been nicknamed the Rosary Ripper. The police had not apparently been able to do much of anything about the murders, and as one victim followed another with no end in sight the general confidence in Scotland Yard—never tremendously high—was plummeting. The entire city was both angry and frightened. Conspiracy theories abounded on the Internet, some less believable than others. This, however, was the first time Greta had heard anything about the Ripper branching out into supernatural victims. The garlic on the walls of Varney’s flat bothered her a great deal. Varney shifted a little, with a faint moan, and Greta returned her attention to her patient. There was visible improvement; his vitals were stabilizing, much more satisfactory than they had been before the extraction. Ruthven didn’t reply at once, and she looked over to see him tapping his fingers on the arm of his chair with a thoughtful expression. “What?” she asked. “What time is it?” Greta asked, stripping off her gloves. He smiled, despite the line of worry still between his eyebrows, and Greta found herself smiling wearily in return.